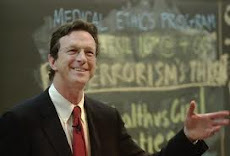 Michael Crichton’s official website has a new “In Memoriam page” with an added section “Remembering Michael” with remembrances from Steven Spielberg, Ray Bradbury, and a few others. It's a brief interview but Crichton talked about State of Fear and Al Gore. Who knew Dennis Miller was a Crichton fan? Miller had some hilarious and intelligent things to say about Crichton's work. I'm so grateful to him for providing the interview. For most of us, it's the last opportunity we had to hear Michael Crichton's voice.